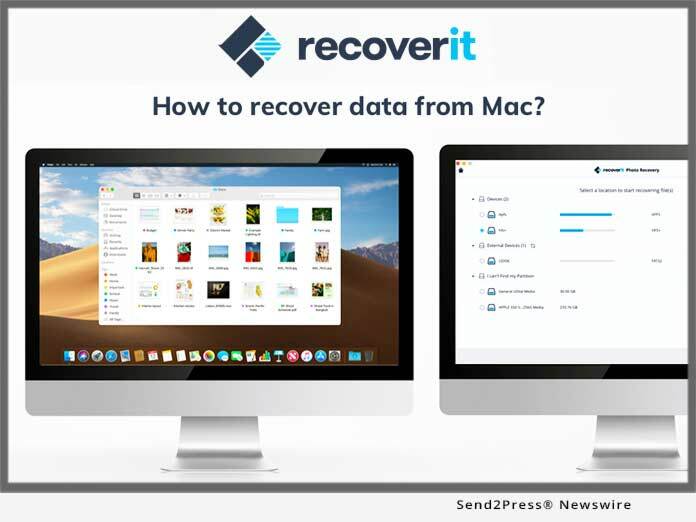 SHENZHEN, China, Apr 12, 2019 (SEND2PRESS NEWSWIRE) -- Recoverit for Mac simply deals with how to retrieve deleted files on Mac without any complications. It is believed to be exceptionally good for prioritizing safety, speed and ease of use. As losing folders on Mac can be a chaos for many users, this tool surely leaves impact by setting such standard. Examining the situations for folder loss on Mac, Wondershare team has brought an expert data recovery tool. The tool certainly makes sure that the users are never left with the doubts on how to recover deleted files on Mac. It can comfortably recover deleted folders on Mac no matter from which storage media it's been deleted. When users lose their important and valuable files from Mac, the moment can be of great concern. At this instance, trying to find every potential way to get it back is understandable. And when a software is offering excessively wonderful features, one can't ask for more. As Recoverit for Mac is totally compatible with numerous file types and storage media, retrieving deleted files on Mac becomes fun. We can consider it as the best data rescue for Mac since it is of great assistance in doing away with all your worries of files/folder loss. On the bright side, if unfortunately, a user has forgotten to save a word document; there is no need to worry at all. Recoverit for Mac simply works on how to recover unsaved word document on Mac and ease off your burden. One can undoubtedly trust on this tool for its great efficiency. It only includes a three-step tutorial following which you will get quality results irrespective of the reason behind the folder loss. What's more, in the event that you accidentally formatted SD card on Mac while transferring data, Recoverit has the solution for it as well. * With Recoverit, retrieving deleted files on Mac is just a matter of seconds as it ensures quick recovery and really works as promises. * It supports a wide range of data loss circumstances. For instance, one can recover data if lost due to formatted Mac Drive, virus attack, system crash, empty trash and the like with just simple clicks. * Another highlighted feature about this software is it can easily rescue the files that are lost on Mac devices having latest encrypted APFS file system. * A great deal of file types is supported with this tool i.e. documents, graphics, video, email, audio etc. * Furthermore, a plenty of devices are supported like memory card, pen drive, HDD, floppy disk, music player and more. There is no doubt left about this software that it covers everything in order to make users understand how to recover deleted files on Mac. Along with this, it offers 24x7 tech support. When it comes to pricing, the plans may vary as per the users' requirement. It may range from 1 year subscription to lifetime license. Also, the quantity of PC will also be responsible for varying price. Overall, if one wonders about how to recover deleted folder Mac or recover word file on Mac, using Recoverit will be a wise option.